For some time, I've been working through what type of antenna I should get. I've finally decided to make the plunge! My antenna of choice is an OCF antenna, as included in ARRL's Wire Antenna Classics, which is a great read for anyone thinking about making their own wire antenna. It has helpful tips, and quite a few great designs. So, the first question is, what is my design? The OCF antenna is an antenna where the dipole is not in the middle of the antenna. Being off centered, it allows for talking on multiple frequencies, although the antenna does have a larger impedance than would otherwise be had. It allows for talking on multiple bands without an antenna tuner, namely the 40, 20, 15, 12, 10, and 6m bands. All in all, it seems to be the best design that will fit in my attic, which is really what I'm trying to accomplish. How is this antenna constructed? It requires 55' of 450 ohm ladder line, 23 feet for one end of the dipole, and 46' for the other end of the dipole. The ladder line is connected to a switchable 4:1/1:1 balun, which will be set primarily at 4:1, but will be switched to 1:1 for 15m connections. I purchased the required items from Ham Radio Outlet (HRO), and they delivered them quickly to my home. Then I took the time to carefully measure the items. This was no easy task! I used a cloth 100' measuring tape, and a lot of patience! Basically, I slowly fed the line out for the measuring tape, then the wire, and pinched the two together. Bit by bit, I carefully measured out the required lengths, until I had it down. Then came the fun part, the soldering. I really needed 3 hands for this! Somehow, I made do with two, but it was still a close call. The first thing to do was to solder the tip of each of the wires. 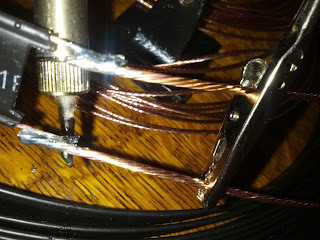 I tried to get a glob of solder left on the tips of each of the wires, so that I could just get them close together. 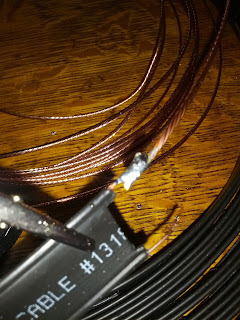 Then I carefully melted the solder on one wire, and got a good connection together. I slowly increased the amount of wire that joined them together, until there was about a quarter of an inch of solder connecting them. Then I proceeded to do the same to the other side. It took me about half an hour to get it done, but in the end, I am quite happy with the final product! Bottom line is, this was a fun project that should have great results. I can't wait to try it out! The plan is to first test it in my back yard, then put it in it's final location, my attic, and see how things go from there! One of the big reasons that I wanted to get involved with Amateur Radio was to tinker more with things. I feel like by doing this project, I have started on that path! Hopefully it will work great, and I'll have great reports to you all soon!